Experimente el pasado de París en este recorrido a pie de 2 horas por el famoso cementerio de Père Lachaise. Un conocedor guía local lo guiará a través de un laberinto de lápidas y tumbas románticas pero a la vez inquietantes, incluidas las de Jim Morrison, Balzac y Oscar Wilde, adornadas con vibrantes besos de cientos de admiradores. Conozca algunas de las figuras e historias más famosas de París en esta excursión para grupos pequeños. 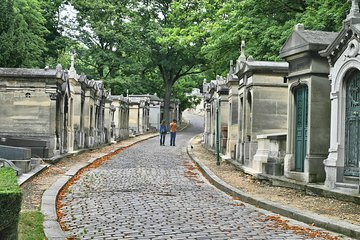 Deja el camino turístico para explorar un cementerio escondido de París. Escuche historias, leyendas y hechos poco conocidos sobre el cementerio de Père Lachaise. Ver todas las tumbas más conocidas, incluyendo JimMorrison y Chopin. Recorrido entretenido e informativo guiado por un guía con un conocimiento excepcional. Grupo pequeño personalizado y comentarios (máximo 25 personas). Su cita con los famosos muertos de París comienza por la mañana en la estación de metro Alexandre Dumas. Conozca a su guía de habla inglesa y pasee por el cementerio de Père Lachaise, el cementerio más visitado de la ciudad. Con una extensión de 110 acres (44 hectáreas), este cementerio alberga a cientos de miles de muertos famosos e infames en tumbas de extravagancia variable. Escuche sobre algunos de los artistas, músicos y escritores famosos del sitio que descansan aquí, como Edith Piaf, Molière, Chopin, Proust, Delacroix, Jim Morrison y Oscar Wilde. Pasee por el laberinto de tumbas y recorra senderos pedregosos para visitar tumbas con acento de excentricidad y distinción. A medida que experimente la asombrosa magnificencia del cementerio, aprenderá historias trágicas de amantes como Heloïse y Abelard, unidos en una sola tumba en 1817 después de siglos de diferencia, y mujeres con visión de futuro como las escritores Gertrude Stein y Collette. Su recorrido de 2 horas concluye en Porte du Rèpos, cerca de la parada de metro Philippe Auguste. It was very interesting to walk through this cemetery. It is well maintained and to see the graves of so many know people, was very interesting. The guide was excellent -I think her name was Karen- and the walking tour was enough for 2.5 hours and we were a small group. After the tour finished you could stayed there or even the guide would help to find your next metro station for a further destiny. We've been to Paris many times, but we never thought about visiting a cemetery until a friend who lives there suggested we visit Pere Lachaise. And we're so glad we did. Zac, our tour guide, was AMAZING - he brought the whole place to life - which isn't that easy at a cemetery. He had stories about the history of graveyards going back centuries, as well as how and why Pere Lachaise was established, and about the many famous people who live there now. Would strongly recommend this tour - and try to get Zac as your guide. A nice, laid back guy, with a great sense of humour, and an amazing knowledge of the place. Such a good tour - the guide was so well informed and he made the trip worth every bit. Fred was fun and knowledgable guide. He knew everything about French and world history.Steps and cobblestones are what this walk is about. If you mobility problems you might twice about doing this on a tour. So happy we did this tour. We were going to go on our own and glad we didn’t. We learned so many things about the cemetery, it’s occupants and Paris itself. Highly recommend this. We loved this tour! The guide was a Vassar history major with a book on burial grounds in the works. She was so smart and knowledgeable, directing us to all the key tombs including Mozart, Edith Piaf and Jim Morrison. It was a rainy day and the experience was one of our most memorable in Paris. Don't miss it. Our tour guide, Georgia, was fantastic! We have taken many tours with in various countries with great guides and she was by far the best! She was a wealth of information and delivered it in such a way that you felt as if you were part of the history. I would very much recommend this tour! This is exactly what it says, a walking tour through the cemetery. If you are looking to see specific graves this does stop at notables, Hendrix etc. then this will be a good tour for you. You walk at a meandering pace that gives you time to take photos and see what you need to see. If you are just looking to see what the cemetery is like this may be too long a time, 2 hrs. The tour is also up and down on cobbled paths and I would not recommend it to anyone that needs a walker, wheelchair or other mobility device. I also would not advise it if you have additional extensive walking later in the day, our group had tired feet. It would have been nice to receive a handout with the information the guide share as it was difficult to take notes. Infelizmente chegamos com 20 minutos de atraso e não encontramos o guia. Recomendo que famílias com mais de cinco membros se programem com muita antecedência para os passeios em Paris, Metro extremamente cheio e muita dificuldade em conseguir um taxi que leve cinco pessoas. Apesar de termos saído com 1 hora de antecedência chegamos ao ponto de encontro com 20 minutos de atraso.